There are a lot of questions as to the relationships between Fed money printing, interest rates and stock market returns. Most commentators seem of the opinion that easy Fed policy is blowing a stock market bubble, which will eventually burst. I’ve taken a bullish stance based on my understanding of monetary policy. Low interest rates are not a sign of easy money, but rather tight money. The Fed is stuck between 0%-2% inflation, which is high enough to produce economic growth, but too low to smooth over the imbalances that built up before 2008. Therefore interest rates will remain low, economic growth somewhat strong, and stocks high (but future returns low). Case in point, Japan. In the graph below we see that short-term interest rates have been below 1% since 1995. That’s 20 years of low interest rates. Was Japanese policy too loose? Did inflation explode from these ultra-low rates? Of course not. In fact, prices barely budged since the early 1990’s, even with massive deficit spending. 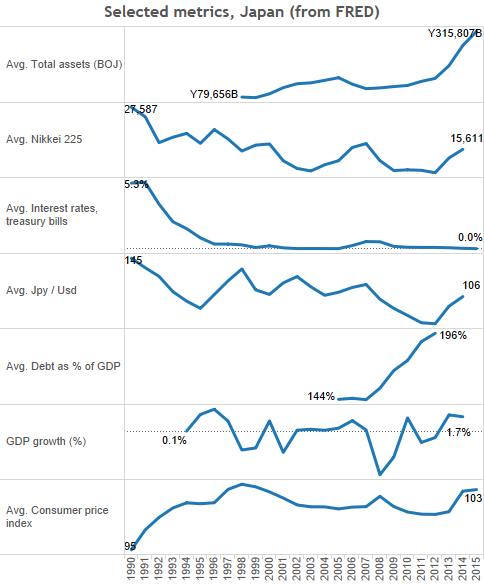 So how are the BOJ’s asset purchases transmitting to the real economy? As in my past post about the hot potato effect, financial instruments appreciated first. Then real GDP began to grow. Then consumer prices showed some life. This is exactly what’s happening in the United States. The 2008 crash was an economic catastrophe. But it’s also a free pass to long-term economic growth with low inflation as far as the eye can see. Low yields, low inflation and strong economic growth add up to a stock market boom. Perhaps prices have become a little unhinged (I’ve argued that stocks are fairly valued, but Philosophical Economics has a great post on why I might be wrong). There will undoubtedly be corrections, but it’s hard to see a crash unless the Fed really screws up and tightens policy too quickly. After all, we have the example of Japan right in front of us.